The unique introduction to almost all of episodes of ‘The Deen Show’. I’ve been hearing the opening to the show for many years so it was beyond amazing hearing it live, here in Dallas, Texas! The Deen Show has always been one of my favorite Islamic internet series ever since I first started watching. When I first heard ‘The Deen Show’ was coming down to D-town my level of adrenalin was probably at the height of that a girl gets seeing One Direction live (I’m sorry but its true). The show itself was even better then how I expected it to be. That’s exactly why I think that it definitely deserves a, “The MreView” from TheMuslimVoice! Note: Unfortunately I was only able to attend the event at Plano Masjid and not the one at Irving Masjid. MreView: The event like I said before was beyond amazing, subhanAllah! The equipment was very high tech including two HD supported video camcorders and amazing lighting! The setup was very neat and nicely done, with a miniature TV with the logo for The Deen Show on it, nice comfy seats for the host and the guests with an amazing background! The show started out with Imam Yaseen (Plano Masjid Imam) in which he discussed his early life and focused on topics around the youth. His talk was then preceded with Shaykh Abdul Nassir Jangda who had similar topics but focused more on parents. Finally out of no where I found out that the special guests on the show (remember only knew about two speakers beforehand) was one young hufaaz, Fatih Seferagić and none other then my good friend Ali Mahmoud! There topic was about of course about their life as a youth and fighting temptation, etc. Okay not the best quality but you can still see the behind the scenes of the show! Highlights: The talks and topics that Imam Yaseen, Shaykh Abdul Nasir, the special guests discussed were big highlights for the event. SubhannAllah all of them did amazing jobs mash’Allah. 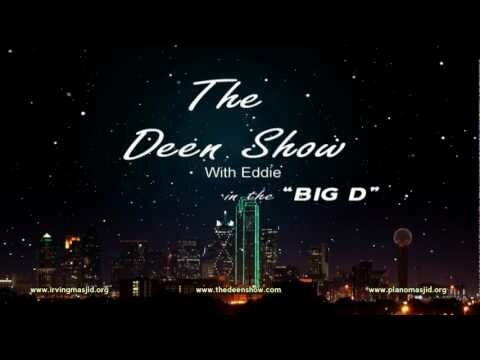 Another worthy thing to note was Shaykh Abdul Nasir’s story about how one young Muslim found his identity as a Muslim through The Deen Show after suffering from addiction to Weed, this made the host, Eddie emotional and I won’t lie, me as well. Last but not least is of course, Br. Eddie’s amazing skill as being a great host and keeping everyone involved and deep into the subjects of the show and also the cool camera man who goes through the hard work of recording the show, May Allah swt reward them both, Ameen. Halal-O-Meter: The brothers had their own seat, while the sisters had their own seats. Perfect family environment. Yaseen, Shaykh Abdul Nasir and the special guests for educating and making the topics very effective. 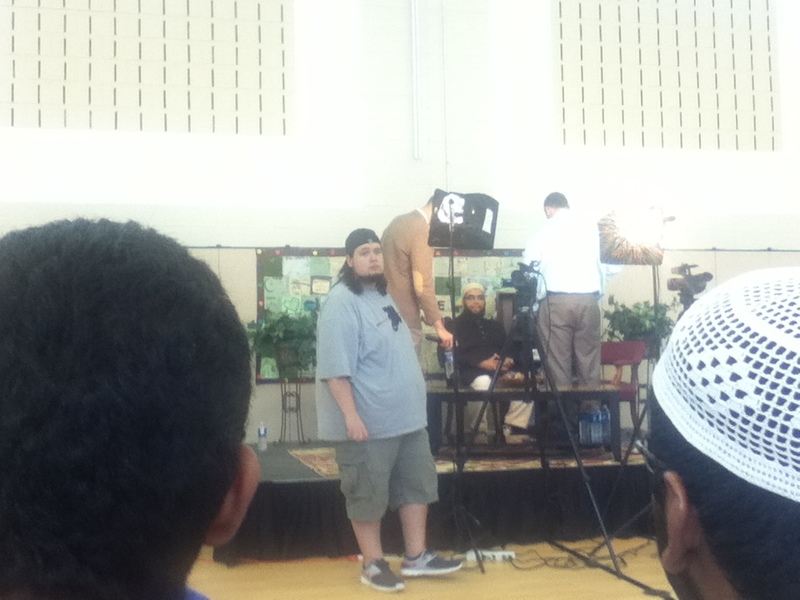 Also, unlike other live events, The Deen Show live was absolutely free! Unfortunately I could not attend the one at Irving Masjid, which may have even increased the rating 🙂 Can’t wait till he comes back for another year insh’Allah! Please show support to Br. Eddie and The Deen Show. Currently only one is out so far, however, I’ll be updated this page with more when the next two come out insh’Allah! Previous Previous post: Dr. Oz is Muslim!